I love fashion. 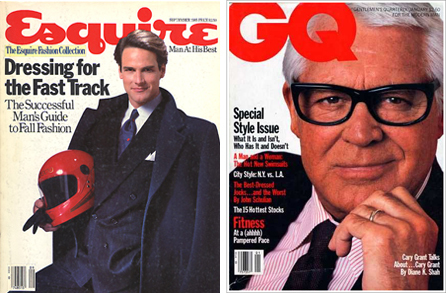 I can remember flipping through issues of GQ and Esquire marveling at how cool the outfits looked. When I got to high school and began working, I did so because I aspired to dress the way they did in the magazines. I couldn’t afford anything featured in those pages but that’s where creativity crept in and judging from the nicknames friends gave me, namely Mr. GQ, I’d say I did all right. One of the things that always struck me about being stylish is the importance of paying attention to the details, which are ultimately matter more than the look. If the details are off, everything else becomes blah. I look back at pictures of myself wearing ill-fitting suits and I cringe. The detail of tailoring is crucial. For me, fragrance has always been an important finishing detail but it hasn’t been the only one. I love pocket squares, cufflinks, and decorative objects like diffusers and incense holders. With that I’m start a new feature on Fragrant Moments, Finishing Detail. Features will include items for the home or your personal style or neither. The point though will be to present things I consider unique finishing details that further express a stylish point of view. First up, Daines & Hathaway Rusty Blaze 10oz Hunter Flask. If you’ve been following me on instagram or twitter, you know I love cigars. I’ve been smoking them for a while now and everything from the aroma to the taste is very enjoyable. Part of that experience is usually accompanied by great conversation with fellow stogie lovers, which is heightened by sipping on a great cognac. 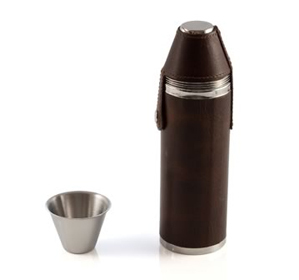 I’m sure the fellas wouldn’t mind if the bottle came out of a brown bag but wouldn’t it look better coming out of this flask? The first time I laid eyes on it, I got chills. The quality is excellent and it possesses a refined rigidness. It comes with 4 cups and is good for those short stories (the name we give to smaller cigars). If you’re not a smoker, it works for poker night or any other night that calls for exquisite spirits. NY residents, you can grab one of these at Burlap in Brooklyn for $115. This entry was posted in Finishing Detail and tagged Burlap, Cigars, Cognac, Daines and Hathaway, Esquire, Finishing Detail, Flasks, GQ, Men's Style, Style. Bookmark the permalink.